A woman wearing a romper. Baby's romper suit, c.1950s. Museum of Childhood (Edinburgh). A romper suit, or just romper, is a one-piece combination of shorts and a shirt worn both by children and adult women. Rompers appeared in the United States of America in the early 1900s. They were popular as playwear for younger children because people thought they were ideal for movement. 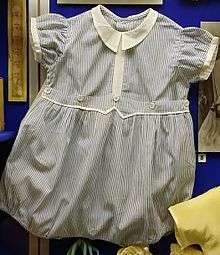 Rompers were in many ways the first modern casual clothes for children. They were light and loose fitting, a major change from the much more restrictive clothing children wore during the 19th Century Victorian era. Styles and conventions varied from country to country. In France they were, for many years, only for boys. While primarily a play garment, we note French children wearing dressy rompers. Their popularity peaked in the 1950s when they were used by children as playwear and by women as leisure- and beachwear. Thereafter the garment has continued to be used by infants and toddlers; however, it has become less common among older girls and women, although never disappearing entirely. In the 2010s the "sleep romper" for women gained popularity, being similar in style to the teddy, but with the appearance of shorts. ↑ "IN THE SHOPS. - View Article - NYTimes.com". New York Times. 1904-05-20. Retrieved 2014-04-13. ↑ "boy rompers barboteuse speelpakje spielanzug Spielhöschen". Histclo.com. Retrieved 2014-04-13. ↑ "French Rompers". Histclo.com. Retrieved 2012-07-31. ↑ Archived June 16, 2008, at the Wayback Machine.